CURBING the road toll by encouraging all motorists to think about their behaviour behind the wheel is the aim of Road Safety Week, which kicks off today. Bundaberg district crime prevention coordinator Senior Constable Danielle Loftus urged everyone to get behind the initiative. "Across our Wide Bay Burnett district we're inviting all of our local leaders, our emergency service colleagues, community members, businesses, local media, and our school communities to think about their driving or behaviours on the road and to speak up about ways they can help keep themselves and others safe on our roads,” she said. "Throughout the week you'll see Queensland Police Service and the Queensland Department of Transport and Main Roads partnering together at a number of community engagement events. Snr Const Loftus said each day Road Safety Week would address a different theme to highlight the key road safety issues. 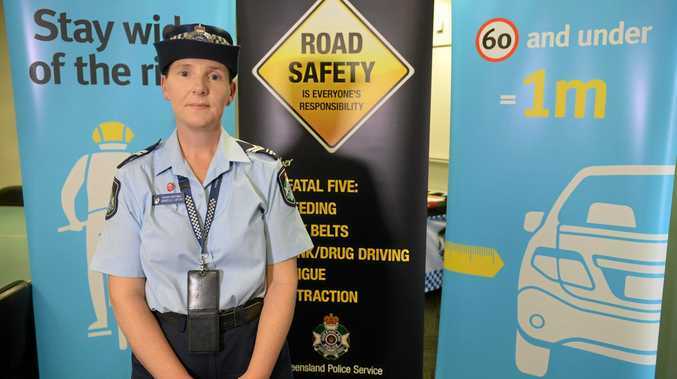 "We're going to be covering distractions and inattention, speeding, fatigue, restraints - and child restraints are included in there - also sharing the road and impaired driving which covers drink and drug driving,” she said. You can get involved by heading along to the launch of Road Safety Week today at Kendall Flat, Bourbong St in Bundaberg East from 10-11am.